The 2016 Total Tools Supplier Conference was held in the tropical surrounds of Cairns at the Shangri La Hotel, from September 5 to 8. With over 180 in attendance, including suppliers, franchisees, store managers and support office staff, the conference was a buzz of excitement from beginning to end. 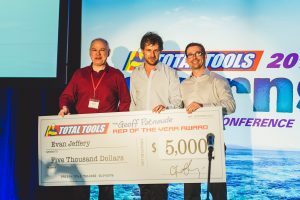 Following a year of rapid growth, the Total Tools network now boasts 56 stores in total, and as such, there was a substantial amount of content to get through over the four days that the conference was held. With such a full agenda, there was no time to lose and no sooner had the 180 delegates landed, they were served lunch and whisked off to the first official conference session, which was an address from Total Tools’ chairman, Warren Jones. Day one also saw platinum sponsors, Milwaukee and Bosch, take centre stage to showcase future road maps to attendees. Th e Milwaukee and Bosch teams then had the opportunity to connect with the network in a less formal manner at the Platinum Sponsor Dinner that night. The agenda was at its peak on day two, which saw the bulk of conference sessions covering importing, merchandising and marketing. However, the day also included an inspirational ‘management’ session, led by motivational guest speaker, Rachael Robertson, who was the youngest woman to lead an expedition team to Davis Station in Antarctica. Concluding the day’s formalities was the traditional Gold Sponsor Rotating Dinner, which saw the group enjoy pre-dinner drinks and canapés upon a private yacht thanks to Apex Tools. Attendees were then split in half where they enjoyed entrées, mains and desserts in two different venues, each hosted by a different supplier – Makita and Saint Gobain. presentations from Stanley Black & Decker (Dewalt) and Werner. Th e official golf tournament proceeded the Gold Sponsor presentations, and include the now renowned ‘loud pants’ contest. 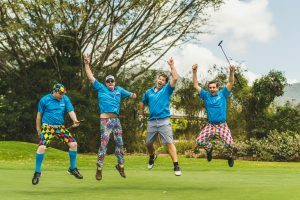 After a full day of golfing, and loud pants, the Total Tools Awards night and gala dinner was a welcomed change of pace, which included a three course meal and entertainment from well know Australian performer Paul McDermott and international comedian Arj Barker. The night also included the much anticipated Supplier and Franchisee Awards Ceremony. cycles and certainly support for a store’s key local events,” said Nicole Bemelmans, Total Tools general manager of merchandise and marketing. Winner of the 2016 Geoff Patnaude Rep of the Year was awarded to Evan Jeffery – Bosch Australia (QLD). 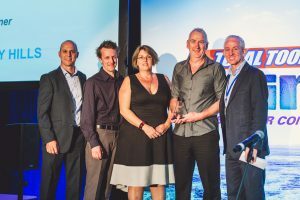 Supplier of the Year Awards “Total Tools would not be in the position that it is today, as Australia’s number one professional tools retailer, if it was not for the support of the suppliers in the room” Mrs Bemelmans said. “Again there is certain criteria that needs to be met to win this award, which amongst others includes sales growth. Important criteria, in addition to sales, is margin and innovation,” she said. (L-R) – Total Tools CEO Tim Cockayne presented the Supplier of the Year Award – Tier Two to Kate and Mark Hunter from Spot-On Tools, along with Total Tools general manager of merchandise and marketing, Nicole Bemelmans. (L-R) – Total Tools CEO Tim Cockayne presented Supplier of the Year Award – Tier One (Top 10 Category) to Milwaukee group managing director, Mike Brendle; Milwaukee national key account manager, Greg Osmond; Milwaukee senior product manager, Sam Nogueira of Techtronic Industries (Milwaukee), along with Total Tools general manager of merchandise and marketing, Nicole Bemelmans. from Spot-On Tools. 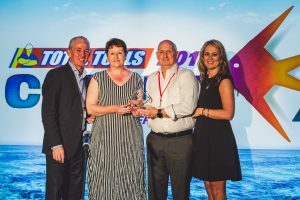 Mark and Kate were particularly con- gratulated for their overall service and support to Total Tools members, not to mention their recent 42 per cent growth. closely with the support office. “They are one of our strategic partners and they are clearly committed to investing in the marketing of their brand. Milwaukee’s marketing to the end user is also second to none and this is what is driving the significant growth that we continue to enjoy from Milwaukee Power Tools,” Mrs Bemelmans said. (L-R) – The 2016 Geoff Patnaude Rep of the Year Award was presented to Bosch Australia’s (QLD) Evan Jeffery by Geoff Patnaude’s sons, Alex and Chris Patnaude. Rookie Franchisee of the Year Award 2016 The Rookie Franchisee of the Year Award was introduced to recognise excellence amongst ‘new’ stores that have been open for less than three years, and which also have a full trading year under their belts. Mr Cockayne said Total Tools has some great new stores, with eight stores opening in the last financial year and two more in the last couple of months. “We have had a lot of new stores coming on and everyone knows we are up to 56, so there are quite a number of people who were eligible this year,” he said. Although the Mitcham store had a few obstacles to get over in the early days, the store’s first full year of trading was fantastic, according to Mr Cockayne. Mr Cockayne said he remembered when Brian first came into the business, he certainly did not come in knowing all about tools and tradesmen, but he does know about numbers and spreadsheets. “Brian really had a great year this year, and is without a doubt the best in the group at retail stock management,” Mr Cockayne said. “Total Tools Gregory Hills has had a magnificent year,” according to Mr Cockayne, who said, in its very first full year of trading, the store exceeded all expectations. “In the very first full year this store has entered the top 20 list within the group,” Mr Cockayne said. Award presentations then moved onto Most Improved Franchise Store Award 2016, with Mr Cockayne revealing that this award was specifically developed to recognise stores that have made substantial changes within their businesses, which may include expanding the store, relocating or growing the business. “The weighing of this award is very much factored along growth and change. We also ensure that compliance is included as well,” he said. 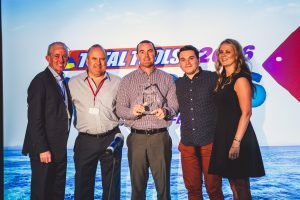 (L-R) – Total Tools operations manager, Scott Fitzgerald; Rookie Franchisee of the Year Award 2016 winners Marty Andrew (store manager), franchisees Tina and Shaun Hindley of Total Tools CEO Total Tools Gregory Hills, with Total Tools CEO, Tim Cockayne. 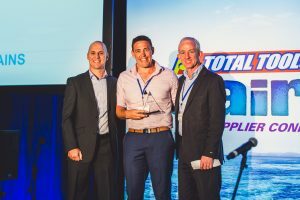 (L-R) – Total Tools Operations Manager, Scott Fitzgerald; Most Improved Franchise Store Award 2016 winner Mark Timbs of Total Tools Coopers Plains, with Total Tools CEO, Tim Cockayne. “Although this store grew really well as a business, Jeremy still did not believe that building a bigger store would be the right way to go. Anyway it took him a long time, but he finally went out and built a big store, and it is now going really well,” Mr Cockayne said. “This is a store that has been around for about five years and has continually performed during this time. And yet, it is able to win the award for the most improved store, even after it has already hit such high levels. But I suppose the reality is that the type of person that runs this store consistently shows the type of drive you need to have in your business. To me Total Tools Ballarat is one of the best stores going around and I certainly can’t congratulate Tim enough,” Mr Cockayne said. Store owners, Phil and Mark, already owned a store in Sydney, but decided to take the big step of moving to Queensland and opening Total Tools Cooper’s Plains, Mr Cockayne said. “Phil is in his late 60s and relocated his whole life to move to Brisbane, which is a massive step. Mark also relocated his life and went up there with a young family. It would be fair to say the store did not take off initially, but it gradually built up over time,” Mr Cockayne said. “The one reason it did build is that number one; they continued to believe in the business, and number two; they worked bloody harder than most other people. For me to see the success that they are achieving, I think this is great not only for them, but for Total Tools,” he said. Store owner, Mark Timbs, said one of his dad’s favourite sayings was ‘the harder you work, the luckier you get.’ “This is certainly true because we do work really hard and we are so proud to win this award today,” Mark said. It really is the Holy Grail to achieve the Store of the Year Award, according to Mr Cockayne, who said to be a contender for the award, the store needs to tick every award criteria box to even be in the running. The award winner has to perform well in every element. It is amazing how between first and fifth place winners, the gap is so small,” Mr Cockayne said. “What I do see is a lot of the same offenders up in that top ten because they basically do everything right; they follow the model and I think that is the thing that makes these stores stand out,” Mr Cockayne. 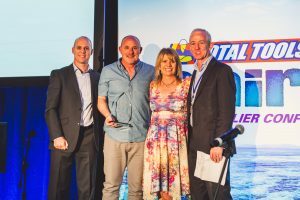 (L-R) – Total Tools operations manager Scott Fitzgerald, Franchise Store of the Year Award 2016 award winners Jeremy & Carolyn Atkinson of Total Tools Lonsdale, along with Total Tools CEO Tim Cockayne. “This award winner was a bit of surprise; probably because to me the store is a little bit tired. But when you look at the criteria, Total Tools Brooklyn has good margin, high penetration of exclusive brands, high compliance, great mystery shopping, and all the basic things that follow the model. It is a mature business and it is about to relocate and we certainly look forward to that,” Mr Cockayne said. This is a store that continually performs and has been around for some time, Mr Cockayne said. “Total Tools Ballarat has continued to be one of the best retail stores, not just in our group but I think in Australia. I have spent my life in retailing and I tell you this guy is one of the best retailers I have ever worked with and he runs a fantastic business,” he said. To win an award like this obviously takes a lot of effort, according to Mr Cockayne, who said Jeremy of Total Tools Lonsdale, runs a great business but he just did not know if he really wanted to go into this bigger store. “I think he talked himself into the larger store and all of a sudden he made a decision, bought a block of land and committed to building the store. Since this time Jeremy has had record sales each month, while his sales in each of the last nine months is also at a record high. Prior to this it would be fair to say that his business stagnated, for probably five years. So this shows that the model works, that expanding and making sure you have got the best offer possible for the customer, not only helps you to get a better business but also helps the customer,” Mr Cockayne said. Store owner, Jeremy Atkinson, thanked all of the support office staff and said the work the team puts in is phenomenal. “I have been into meetings and these guys at head office are there at 7am and I leave sometimes and they are still there at 7pm. These guys bleed for us and this is part of our success as well. The culture that is built within Total Tools was built long before I come along and I just hope this continues because we really do appreciate everything that support office does. To all the suppliers, I couldn’t be there without you guys. You guys also do a terrific job in supporting us at Lonsdale. When we moved, it was exceptional the amount of work that a lot of you guys put in and you really did look after us to make sure that we got up and running,” Jeremy said. The fourth, and official last day of the conference saw the commencement of the Supplier Showcase Expo, which had over 35 suppliers showcase their latest and most popular products throughout the day. The shotgun start meant that every franchisee got to see and spend time with every supplier, negotiating deals for the remainder of the year. On the final day of the conference, all were in agreement that the 2016 Total Tools Supplier Conference had not only been a great success, but also extremely productive with suppliers and franchisees taking plenty of good advice back to their businesses.